Literally "rolling" of the painting table are a quartet of Egyptian chariots by Black Tree Designs. When they had their sale on Ancients infantry this winter, the Chariots were, oddly, included. So who am I to complain about semantics? I needed more chariots to crush the foes of Egypt, Semitic or otherwise! The first set is one of the several BTD codes for Egyptian Light Chariots. I imagine only the crew figures differ between the sets. As is often the case with any manufacturer's Egyptian Light Chariots, it is often a challenge to fit the crew figures into the cab. The driver on the left of the picture has his foot braced on the opening of the leather cab, and is leaning back hard to restrain his team. At least that's my story! On the other hand, perhaps the driver was just the victim of a well placed enemy arrow! This second pair of chariots is one of the "Egyptian Heavy Chariot" codes; the only difference seems to be the size of the cab. would have been constantly bumping into and rubbing on one another during action! I think I have the crossbar on the yoke glued upside down (should be on top of the long piece rather than underneath it), but eh, it works! Regardless, Pharaoh is happy to have them added to his army, and all ready for my Historicon game ! No don't look at the messy blobs of epoxy I used to get these guys to stay firmly in place, LOL! Note the difference in the cab size and crowding of the crew! With it's dominant color of yellow, this unit will go to reinforce the under-strength chariots of Division Ra. Back in Prague, November 1420 saw Hussite politics again come to the fore, as they resumed the search for a candidate for a new King of Bohemia, and debated doctrine, priestly vestments, and other religious issues between the factions. FInally, Nicolas of Pistny, a prominent Hussite Nobleman of the radical Taborite faction who had long had designs on the Bohemian crown himself, was making him,self a pain with his arrogance and obstinacy. Overall, the conservative factions in Prague and their noble allies gained the upper hand for the moment. Frustrated by these setbacks, Nicolas decided to leave Prague and resume active campaigning, hoping to bolster his status with military success. He planned to take some of the towns and castles in the Prague area that still held out ofr the Royalist cause. The first was Ricany castle, which Nicol;as besieged with his Taborite troops in late November of 1420. ALthough the castle was not strong, his forces were insufficient and he had to call for reinforcements from Prague, When these arrived, a joint pre-battle mass was held, but the factions nearly came to blows over the ornate vestments of the Praguer Ultraquist priests, and overt conflict was only averted by the leaders intervening and deciding that the masses would be celebrated separately by faction! Ricany finally fell on December 4th, and on December 6, 1420, Nicolas along with the Taborite and Utraquist troops returned to Prague. There, Jan Zizka had brought 4 prominent pro Hussite (but mot necessarily Taborite) nobles to the city in an attempt to mediate between the increasingly hostile Hussite factions. Hussite Handgunners. Painted using a palate with grey tones predominating, these men seem to be taking the Taborite injunctions against opulent clothing very seriously! An initial conclave before the four Nobles on December 6th resolved only to refer the issue of the vestments for debate between the religious leaders of the factions on the 10th, moderated by one of the Nobles. Meanwhile, in an attempt to foster better relations between the members of the two factions,. a banquet was to be held prior to the proceedings. While Zizka and his supporters agreed to attend, Nicolas of Pistny, still frustrated by the lack of influence that he felt that he deserved, refused to attend, stating that it would give his enemies a chance to murder him! Thereafter, Nicolas left Prague in a huff, vowing never to return. Note the Chalice on the trumpeter's banner, the most common Hussite emblem. However, he was barely out of the city gates when his horse stumbled and he was thrown, suffering a severe injury to to his chest and a broken leg. He was brought back to Prague by his men, over his loud protests. With treatment by the best [physicians in Prague, his leg did well but the chest injuries ultimately proved fatal, and Nicolas died 2 weeks later. Once again, some basic shading followed by a heavy application of a dark, black "magic wash" really brings out the many details in the fine Kingmaker figures (now sold by 1st Corps). Although the banquet went well, the disputation began with the conservative Ultraquist faction accusing the Taborites of 72 counts of potential heresy. The Taborites responded that most of the 72 items were either distortions or completely untrue, and compared the proceedings to the Council of Constance, except that Jan Huss had only been charged with 40 counts of heresy!. It is notable that Zizka, who attended, seems to have said nothing, suggesting that he was in agreement with many of the criticisms of the more radical Taborite priesthood. After some conciliatory remarks by one of the University masters, he meeting ended with an agreement to present both the Ultraquist complaints and the Taborite responses in writing for further consideration. A final view of these "grey" Hussite Hndgunners. In January of 1421, Jan Zizka started new operations in the Pilsen area, long strong supporters of the Royalist cause. He surprised his enemies, both by attacking in the winter, and by approaching via a circuitous route. Fortified monasteries, villages, and castles fell to the Hussites in rapid succession. Upon learning that Bohuslav of Svamberg, a leading Royalist noble and skilled commander, had retired to his castle, Zizka and his men changed their plans an besieged his stronghold. When it became clear that he couldn't hold out for long, Bohuslav negotiated a surrender. The terms granted by Zisza, who respected Bohuslav, were quite generous, with Bohuslav being held under house arrest. This caused some grumbling among his taborite troops, but they removed one of Sigismund's key supporters. as the year progressed, Zizka began paying Bohuslav regular visits, and by October he had converted him to the Hussite cause, and he was released and fought on their behalf. A unit of Hussite skirmish Crossbowmen, once again very plainly dressed in shades of grey. These successes alarmed both the ethnic German residents of Pilsen and Sigismund, as well as the dukes of the nearby German territories. When Zizka came within a short distance of the Mountain passes leading to Franconia and Bavaria, Sigismund at last acted, feeling that Zizka had over extended himself and might be cut off. However, Zizka strengthened the garrisons of the key castles and withdrew to Tabor to recruit and strengthen his forces, while also requesting assistance from Prague. Sigismund, finding Zioska gone, settled down to siege the castle at jkladruby. Although outnumbering the hussite defenders 10:1, the Royalists made slow progress against a very active defense. Their many victories allowed the Hussite to regularly upgrade their weapons and armor. Although the Hussites were the greatest users of gunpowder weapons in European history up to their time, crossbows still outnumbered handguns in their forces. While the Hussites were engaged around Pilsen, Hromadka, a sexton who was one of the early leaders of Tabor, took about 1,000 troops and tried to establish a new Hussite community in the upper Elbe valley. His forces occupied two towns, but this provoked a response from Royalist forces lead by Nicolas the Fierce. His troops retook Prelouc in late January of 1421, killing many of the Taborites and taking roughly 125 prisoners, who were brought back to Kutna Hora, presumably to encounter the dreaded mineshafts. Worse was to follow. Note the studded jerkins on two of the Crossbowmen. In early February, Nicolas' forces, assisted by a couple of supporting Royalist nobles, besieged the second of Hromadka's towns, Chotebor. Many of the Taborite troops had been sent away to resupply, so the defenders were at a severe disadvantage. After a five day siege, Hromadka sought terms. The Royalist leader on the scene, Mestecky of Opacno, agreed to allow the Taborites to leave unmolested if they would surrender the town. Hromadka agreed, but Mestecky promptly reneged upon his promises, arguing that oaths made to heretics were not binding, He burned 300 Hussite men on the spot, and forced their wives to watch. The remaining 700 or so were marched to Kutna Hora. Those who were too weak to keep up were clubbed to death, and 40 more uncooperative prisoners were burned to death along the way. The survivors were thrown down the infamous mine shafts at Kutna Hora, and Hromadka himself publicly burned in the town square. Hussite women were known to fight alongside their men. Considering their potential fate if they were captured, it was probably their best self interest to do so! It is not hard to imagine these Hussite women taking their vengeance on their counterparts at Chomutov. The Taborite and Praguer forces returned to Prague victorious on Match 21, 1421. Along their return route, two towns that had been retaken by Sigismund the previous year rejoined the Hussite cause, their Royalist garrisons fleeing at the approach of Zizka's forces. As a result of the campaign, most of Western and Northwestern Bohemia had been brought under Hussite control. There were two remaining Royalist strongholds in the Prague area that still needed to be dealt with, the towns of Beroun and Melnick. Zizka's forces proceeded to Beroun, whose Militia were commanded by an Italian condottiere, Rodolfo Bece. The town was taken in six days, on April 1, 1421 and their commander killed in the process. After that, the town of Melnick submitted to Prague on it's own, accepting the Four Articles of Prague and denouncing Sigismund. This is definitely the view of these Hussite women that I'd prefer to see if they considered me an enemy! The Hussite's main army departed from Prague once again on April 13, 1421, and on April 17th they assaulted and captured Cesky Brod, a well fortified town that had been garrisoned by several hundred German mercenaries. Most of the defenders were killed. Ater this swift victory and the events of Beroun Chomutov, many more Bohemian towns submitted to Prague and joined the Hussite cause. A Key hold out was Kutna Hora, home of the rich but infamous silver mines and the center of Royalist resistance. The Hussites approached the city in great force on April 23, and the next day the city dispatched representatives to try to escape the destruction of their city. They offered to accept the Four Articles of Prague, and recognize Prague as their capitol, provided that those who dissented were allowed to leave the city first with whatever they could take with them. The radical cleric Zevilinsky was in charge of the Hussite expedition, but for once he chose to accept these terms, on the condition that the entire population of the town do penance. The town duly submitted, and the penance was done on April 25th. It was a tremendous economic and political aquisition for the Hussite cause. Talk about femme fatale; these women mean business! Zizka spent much of the next several months extending the control of the Hussites over most of the rest of Bohemia, and suppressing some of the more radical sects that had sprung from the Taborite faction. In the process, a minor conquest was a small wooden fort atop a hill, originally built by Teutonic Knights. Zizka rebuilt the modest castle in stone, and claimed it for his own, the only time that he ever did this, renaming it "Kalich", which is Czech for Chalice. He made it his new home and henceforth refereed to himself as "Jan Zizka of the Chalice", and changed his coat of arms from a crab to a chalice. This statue of Jan Zizka. 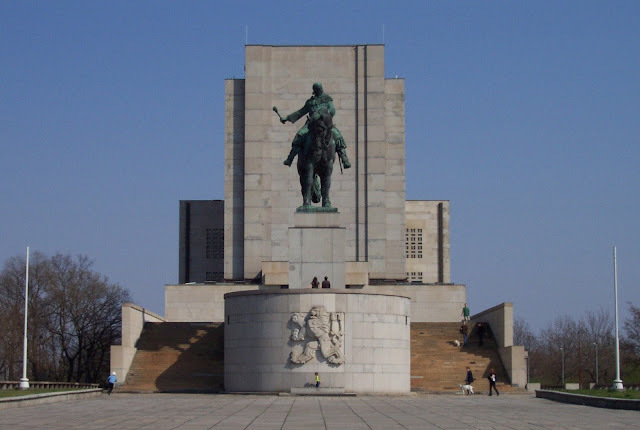 which stands astride the Vitkov hill in Prague, was erected in 1950 and recently restored. It is the third largest equestrian bronze statue in the word. The sculpture is 9 m high, 9.6 m long, and weighs 16.5 tons. Under the German occupation of Czechoslovakia during World War 2, the models and other materials related to the planned statue were hidden away to prevent their destruction by the Nazis. Jan Zizka was convinced that disunity among the Hussites would prove their downfall, and he was very much a devout Hussite theologically. Particulalrly concerning to him were several splinter groups encompassing various fringe beliefs collectively referred to as Pikharts. Their most defining difference from both of the main Hussite factions was that they believed that the essence of Christ was present in the elements of the Eucharist only ceremonially, effectively denying transubstantiation. This was a concept of John Wycliffe's called remanence, and it was brought to Bohemia circa 1418 by immigrants from France and Belgium who were fleeing religious persecution. The Adamites have been mentioned previously, but a more serious issue was that of Houska, who was practicing a new form of communion where the bread was passed around to be divided among the congregation. Houska felt that this was a more authentic representation of the Last Supper, bu this practice was anathema to all Bohemian Hussites, who were fighting and dying for the right to take communion in both kinds specifically because they believed that it was essential to their salvation. . Houska was well liked and was given several chances to recant, but remained rebellious. He was finally imprisoned on June 20, 1421. The Zizka statue in its setting at the National Monument at Vitkov Hill. It was during this time that Zizka lost the sight in his remaining eye, the victim of an arrow shot during the siege of Rabi castle. Zizka survived this grave injury, but his recuperation took 2 months. Amazingly, he continued to lead his armies for almost 4 more years thereafter, despite being blind in both eyes. After a long period with repeated failures to persuade Houska of the errors of his ways, a recovered Zizka decided that the instrangient renegade cleric had had sufficient time to repent, and he was burned at the stake for heresy, along with one of his chief supporters. With my Historicon games fast approaching, I figured it was time to start wrapping up the few terrain items I need to complete before July. First are these two towers, which will act as (fortified) camps for my Assyrian army in their battle against my expanded Egyptians with "To the Strongest!" on Thursday morning. Regular readers might recall that last year I bought a pair of "castle" wooden bird feeders at Michael's (a US Craft Store chain). They reminded me of the "Ziggurat" style towers often depicted in the ancient Middle East. I got as far as spray painting them a deep orange-brown color, to suggest baked clay. It seems the surface of these were often white washed or painted, so I resolved to do the same. I first painted the surface of the "blocks" Delta CC "Bisque", a creamy off white color. However, that just looked *too* white, so I changed gears and painted them with Craftsmart Khaki instead. See, there IS a use for Khaki paint in my collection, LOL! I painted the crenellations with Delta CC "Maple Sugar Tan", and the base with CC "Palomino Tan". Finally, I touched up the orange brown base color with CC "Terra Cotta" as needed. I then drilled two wholes the size of the pegs on my new Palm trees on either side of the entrance way, so that I could change the flanking palms for slightly different looks. Here it is with the 4" palms. Here are the "Twin Towers" with yet another different kind of palms at the gateways. Finally, the towers with my pair of Assyrian Winged Bulls (Lamassu or Shedu).